We are Exporter, Manufacturer and Wholesaler of Marble Products. We unfurl our splendid range ofMarble Productsthat are designed in accordance with the needs and wants of our clients. We are manufacturing all kind of marble products like Marble Clock, Marble Pojja Thali, Marble ped holder , marble chowki etc. We believe in customer satisfaction. We majorily supply in India, USA, Australia, Dubai, Malasiya, UK, France, Europe etc. 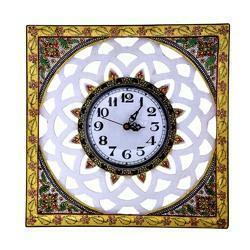 We offer Marble Table Clock with fine fold artistic work. It is very much useable at your Office/Home. It is very appropriate gift for corporate gifting. 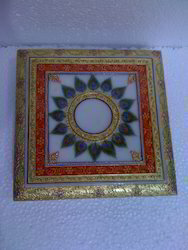 Our organization is considered as one of the noted manufacturers of various kinds of Marble Chowki as well as Chowki for Pooja. Our team of experts and artisans are engaged in designing and offering Chowki for Pooja of numerous types, exquisite patterns and of unique designs catering to the requirements of our esteemed customers from all over the world. With years of experience in this domain, we are able to provide complete satisfaction to our customers by designing and offering them a wide range of Chowki for Pooja and also Marble Chowki. 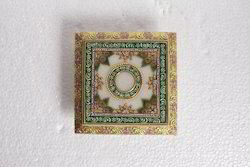 These products are mainly used for decorative products. Our artisans use latest techniques and machinery in order to deliver the products of flawless quality to our clients. In order to supply the best gift ever, we are offering our clients with high end products that can last for a longer period of time. 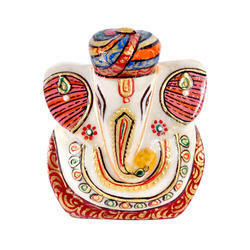 Among our different products that we have in store, the Marble Ganesh Chowki can win over the heart of many buyers. Our buyers, who live in different parts of the world, believe in our services and reliability and can get quality products from us at market leading prices. 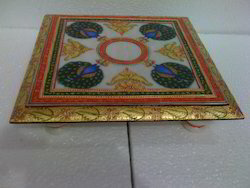 Clients can avail from us Chowki for Pooja and different types of Marble Chowki at pocket friendly prices. The main motive of our organization is to provide complete satisfaction to our clients by providing them products of perfect finish as well as of good quality. The products offered by us are in great demand in international market and are available at cost effective prices. 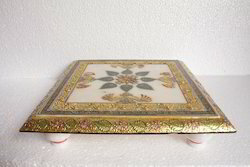 Our company is engaged in manufacturing and offering a wide range of products like Marble Chowki, Chowki for Pooja and many other types of Chowki. Our esteemed customers from all over the world can avail from us products of exquisite patterns, unique designs and colors as per their requirements. We design and offer products of international standards and also at industry leading prices. 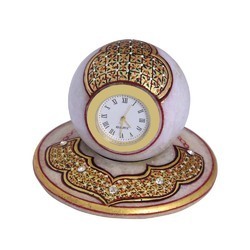 Considered to be a leading name in manufacturing and supplying of Decorative Marble Table Clock, we offer an exclusive range of these clocks. The working of these clocks is very efficient without downloading data. These are available with various specification and our clients can purchase these from us as per these choices. We offer these clocks at reasonable price range. Considered to be a leading name in manufacturing and supplying of Clock with Meenakar, we offer an exclusive range of these clocks. The working of these clocks is very efficient without downloading data. These are available with various specification and our clients can purchase these from us as per these choices. 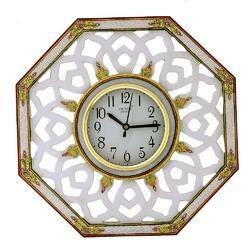 We offer these clocks at reasonable price range. Considered to be a leading name in manufacturing and supplying of Marble Wall Clock, we offer an exclusive range of these clocks. The working of these clocks is very efficient without downloading data. These are available with various specification and our clients can purchase these from us as per these choices. We offer these clocks at reasonable price range. 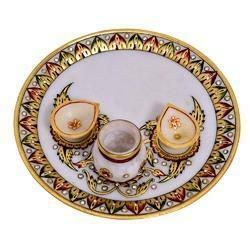 One can get high range Marble Pooja Thali which is not only attractive but at the same time, decorated with lovely designs. There are beautiful small diyas & lutiya that are attached with it. Top grade raw materials are used for manufacturing this product and users are going to get this within the stipulated time period. It is not going to cost much. 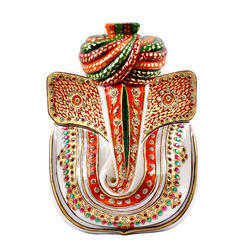 We are one of the leading manufacturers and exporters of highest quality Ganesh with Turban that is made under the leading guidance of strict professionals who are associated with our field for some years now. The materials are procured from trusted vendors who are related with our firm for years. There are also certain important facilities available that makes this a vital artifact for all. 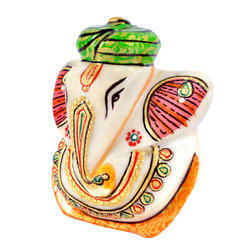 It is 5" size Marble Ganesha wearing turban which is in a traditional pattern, this makes it very attractive. 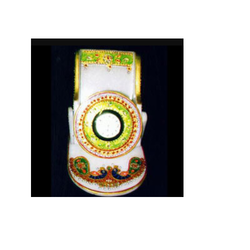 There is gold art work with meenakari on this special idol. This Murti is made in one piece as Ganesha is sitting on the marble base on the bottom. Known for our reliable services, we are able to manufacture top end Ganesh Statues that is made at par with the international market level. This statue is made using nice quality Marble that are obtained from trusted vendors who are associated with our field for some years now. This product is being manufactured with modern tools and machines in order to get fine make and finishing of this idol at the end. 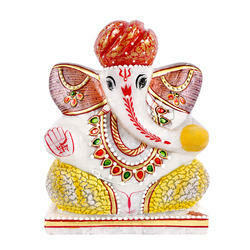 We offer 2.5"size Marble Ganesha with gold art work on it. It is very much useful to gift someone as a souvenir from your side. It is also an ideal article to stick on your car's dashboard. 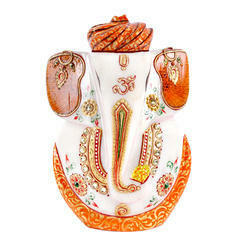 We are one of the leading manufacturers and exporters of highest quality Lord Ganesh Statue that is made under the leading guidance of strict professionals who are associated with our field for some years now. The Marble stone is being procured from trusted vendors who are related with our firm from many years. Being one of the trusted names engaged in offering an exquisite range of Marble Elephants, our clients can avail these from us in various sizes and designs. These are manufactured by us keeping in mind the industry set standards and norms. These are used for decorating hotels, restaurants and homes. We offer these products from us at market leading rates. We are offering our clients with a high end Marble Ganesh Moorti that is known for its gorgeous look and durable standards so that it can last for a longer period of time. 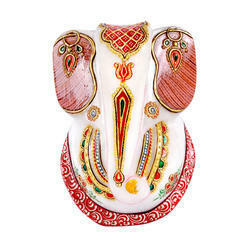 We are one of the leading manufacturers and exporters of highest quality Marble Ganesh Idol that is made under the leading guidance of professionals who are associated with our field for years now. We are offering our clients with a high end Marble Ganesh Idol with Box that is known for its gorgeous look and durable standards so that it can last for a longer period of time. We are one of the leading manufacturers and suppliers of high end Marble Mobile Stand with Clocks which are the mark of excellent craftsmanship. This product is useful in every possible way and is made using some of the finest quality raw materials that are available near hand. These are procured from reliable vendors who are well known in this field. 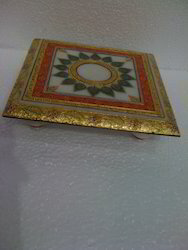 We offer Marble Chowki with fine gold artistic work. 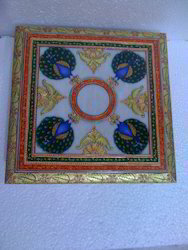 This chowki size is 9x9" . It can be used for putting some artifact on it and it is nice to decor in your home. It can also be used for Pooja purpose. It is very ideal. 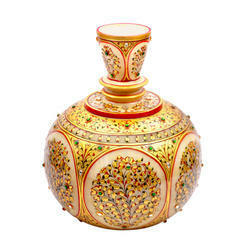 We are one of the well known manufacturers, suppliers and exporters of MarbleDesigner Jar. With the utilization of superior quality raw materials and contemporary techniques we manufacture these jars. 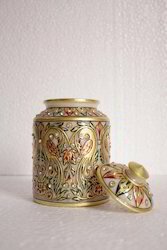 Available in various sizes these jars are used for the decoration purpose. We offer these jars to our customers at affordable price range. 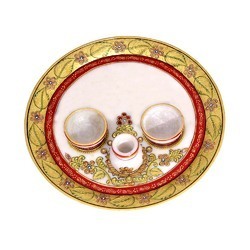 Traditional Chowki, Marble Chowki and Chowki for Pooja are available with us at industry leading prices. The products manufactured and supplied by us are of international standards are also in great demand in international market. Clients preferred using the products designed by our artisans and manufactured by our professionals because we ensure durability and reliability to the products offered by us. Our clients can avail from us a large amount of marble artifacts like Marble Ganesh Statue 5 Inch which is not only an artifact but a religious idol that will enhance the look of the holy shrine. 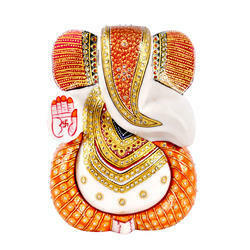 The Ganesha idol is embellished with multicolored stones and golden color that makes it even more stunning and ravishing. The dark green border at the bottom helps to attract lot of attention at a go. 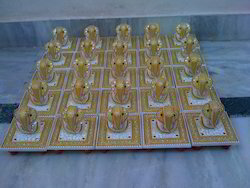 We are Leading Manufacturer, Exporter of Marble Ganesha Murti with Gold Work. Our artisans use latest techniques and machinery in order to deliver the products of flawless quality to our clients. 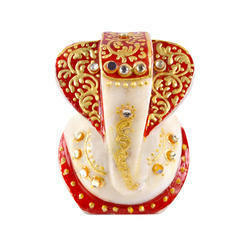 We are one of the leading manufacturers and exporters of highest quality Marble Ganesh with Turban that is made under the leading guidance of strict professionals who are associated with our field for some years now. 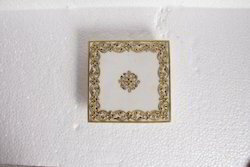 We are one of the leading manufacturers and suppliers of top grade Marble Surahi With Fine Gold Work for an elite look to the whole piece. The lovely light pink color is making the piece even more stunning and beautiful. Some major features are durability, high tensile strength, and fine finish. 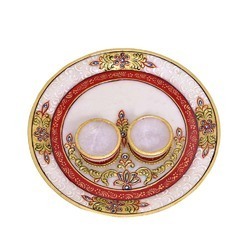 One can get high range 12"size Marble Pooja Thali which is not only attractive but at the same time, decorated with lovely gold artiistic design. 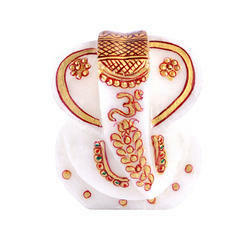 There are beautiful Ganesha idol , 4 pieces small deepak and 1 piece small Lutia, that are sticked on it. It is ideal artefact for doing aarti on several occassions. Top grade raw materials are used for manufacturing this product and users are going to get this within the stipulated time period. Packaging Details: We pack in velvet box. This product can be the best ever gift for your near and dear ones. 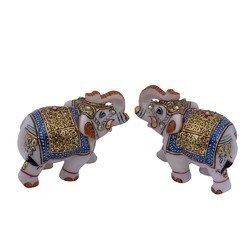 This set of Marble Elephant Family Set is well decorated with bright and vibrant colors along with different cute features, which makes it a must have for all. 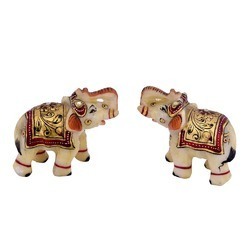 The elephants are of different sizes and can also be custom made as per the growing requirement of the clients. This product can be the best ever gift for your near and dear ones. 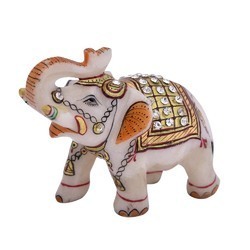 This set of Designer Marble Elephant Set is well decorated with bright and vibrant colors along with different cute features, which makes it a must have for all. 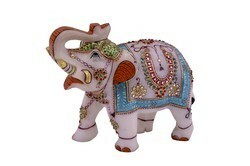 The elephants are of different sizes and can also be custom made as per the growing requirement of the clients. We are offering our clients with a high end Marble Ganesh that is known for its gorgeous look and durable standards so that it can last for a longer period of time. This product is heavily designed with heavy stones along with bright printed colors that make it stunning and ravishing to look at. Users can get this product from us at market leading ranges. We are offering our clients with a high end Marble Ganesha Idol with Gold Work that is known for its gorgeous look and durable standards so that it can last for a longer period of time. We are offering our clients with a high end Marble Ganesha Statue with Gold Work that is known for its gorgeous look and durable standards so that it can last for a longer period of time.